With today being Dr. Martin Luther King Jr. Day, I was trying to find something pertaining to him. In the January 20, 1966 issue of The New York Times I found a small article stating that he was sending his top aide to Birmingham “…to help organize demonstrations protesting alleged voter registration discrimination…” Also, “…At the same time a call went out from Dr. King’s headquarters in Atlanta for a meeting next week of civil rights leaders… to map strategy for mass demonstrations against segregated Southern schools…”. 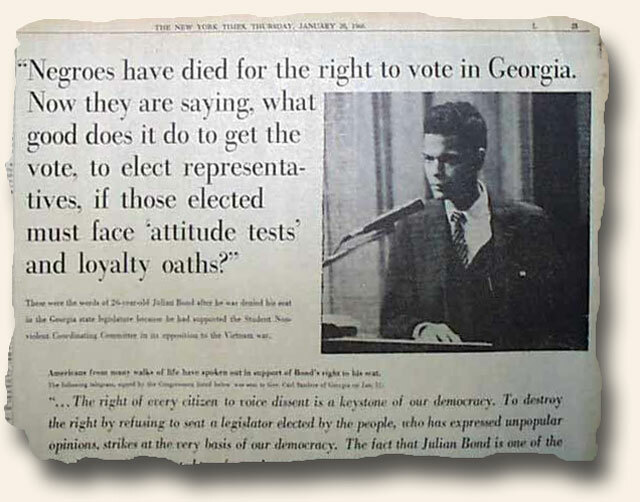 Also in the issue is a nearly full page advertisement for the support of African-American congressman Julian Bond, who was voted into Georgia’s House of Representative after the Civil Rights Act of 1964 and the Voting Rights Act of 1965. But the state representatives voted 184-12 not to seat him due to his affiliation with Student Nonviolent Coordinating Committee. He took this matter to higher courts in order to be seated. The advertisement reads “Negroes have died for the right to vote in Georgia. Now they are saying, what good does it do to get the vote, to elect representatives, if those elected must face ‘attitude tests’ and loyalty oaths?” This includes list of names of his supporters including: Rev. Martin Luther King, Jr.; Woody Allen; Mr. & Mrs. Harry Belafonte; Diahann Carroll; Sidney Poitier; Dr. Benjamin Spock to name a few. The first woman prime minister to India had been chosen, Mrs. Indira Nehru Gandhi, only the third Prime Minister to head India. She was the second woman in modern history to head a government. Hello William – Thanks for your note… and I understand. The reality is, for better or worse, the ability to find such newspapers has become dramatically more difficult over time – and as a result, what we once were able to obtain for a song are now considerably more expensive for us to procure. The good news is that the collections people have assembled over the years are now worth considerably more. Of course the bad news is that purchasing new issues has become more of a challenge. The majority of those in the collectible still feel that newspapers are undervalued as compared to most hobbies/collectibles of similar-aged material – i.e., that we are still on the upside. In your case, while nice Confederate papers are are still worth pursuing, they are almost impossible to find… are therefore rather expensive as compared to others of the period. Still, we appreciate your situation. We’re just not sure what to do to help.